From a young age, Yinglei Zhang was influenced by her family’s artistic friends and her father’s art collection. She began practicing Chinese calligraphy at age of 7. Beginning her studies in Chinese painting with Master Guo Ziyu in 1995, and with Master Li Xubai since 1996, She has also studied western Drawing and Oil Painting, Chinese Art History, and holds a MA from Saint Michael’s College with a focus in Comparative Art through independent study programs at both Shelburne Museum and in Paris in 2001. Her extensive and diverse studies have helped form her unique style. Yinglei’s knowledge of Chinese literature, poetry, and calligraphy provides a strong foundation that gives her artwork tremendous depth. 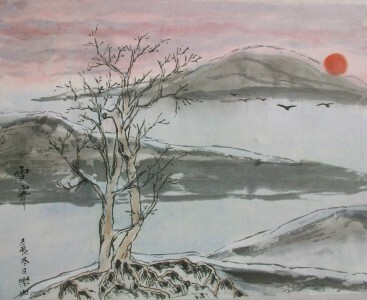 The bamboo, plum blossom, and pine trees are symbols of integrity, strength, and beauty, often appearing in her work. Yinglei blends her modernistic sense with more traditional structures of Chinese Painting to create her stylized source. 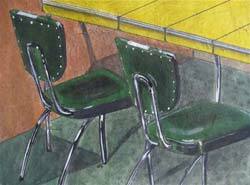 While often sketching from nature, she infuses her own world perspective into each work of art. There is a clear sense of harmony and motion, an inner landscape open through the quiet details and graceful composition. Through the of use ink and limited color, working on Xuan paper with brush strokes that are dually subtle and bold, graceful yet full of strength, Yinglei draws the viewer to pause and take in her view. Yinglei Zhang was born in China and came to United States in 1985 to pursue advanced study. After moving from coast to coast and living in more than ten places, she settled down in Middlebury, Vermont in 1997. She has made Middlebury her home ever since. 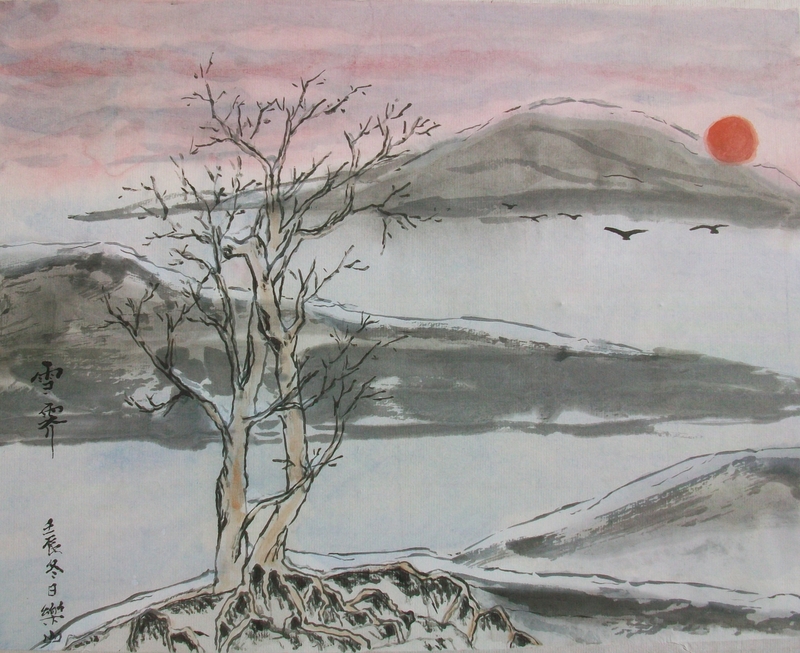 She currently teaches Chinese painting privately and through Middlebury College, Williams College, The Park School, and many institutes in New England. Born in Vienna, Austria, Calitri has been a long-time resident of Vermont. She received her B.A. at the University of VT, her M.A. at Cornell University and pursued doctoral studies at Columbia University. A visionary at 91, Calitri is continuing to master new forms of artistic expression, adding to her vast knowledge and experience of working with various art forms. Navigating the ever expanding course of her career has brought her to a place of defining freedom through abstraction. 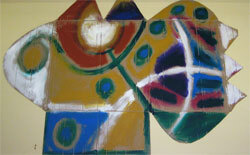 “My abstracts are sculptural, palpable works,” Calitri states. Through the Allegories series, she floods viewers with patterns and trails that guide into the past and future of her imagination and lead us deeply into our own; she is mapping the way for the rest of us.the opening through which we might pass into a new world of our own making. 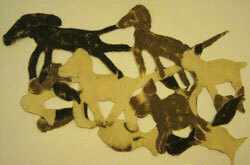 Graziella Weber–Grassi is a Swiss-born experimental artist currently residing in Whiting, VT. Her international art career has included multiple shows in New York and Geneva, several collaborative installations and an Artist Residency at Burlington City Arts for her interactive installation – NIMBY (Not in MY Backyard), as well as BCA sponsorship for Suddenly Visible – a “viral” outreach art exchange project to create humanizing global dialog during the height of the financial and housing crash. Graziella’s work explores subtexts ranging from how we collectively adapt and process crisis to compelling themes involving the deep undercurrents of memory. 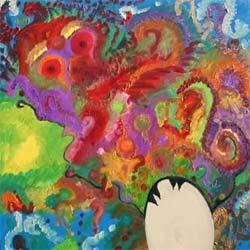 Her work sets the stage to explore and resolve our inner conflicts by approaching the lost innocence of childhood. Compelling themes of childhood compete for attention in Graziella’s paintings. As adults, we look back nostalgically, yearning to recreate the sense of wonder and naiveté that is the province of youth. Yet darker, deeper undercurrents invade our experience, creating tensions between the hopes and dreams of a child and the reality of imperfections held in sacred family secrets shielded by almost impenetrable facades. In a playful way Graziella juxtaposes memories from her Swiss childhood with quintessential Americana images evocative of the pop culture of the 1940s. Her collage-like canvases set the stage for people to explore and resolve their own inner conflicts while searching for the lost innocence of childhood. Visit Graziella’s website. M P Landis’s current work is a palimpsest of the processes, materials and emotions of his existence. He has collaborated with musician Tom Abbs, visual artists Paul Bowen and Bert Yarborough, writers Nick Flynn and many others. 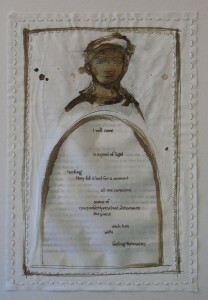 Landis has taught at the summer workshop program at the Fine Arts Work Center in Provincetown, MA. He is a Creative and A&R Consultant for Northern-Spy Records. 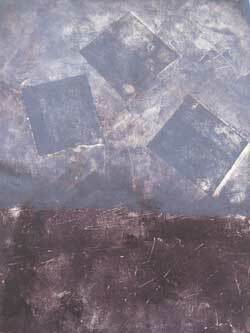 His work is represented in many private and public collections, including the New York Public Library, the Peabody Essex Museum, the Bowdoin College Museum of Art, the DeCordova Museum, the Naples Museum of Art, and the Provincetown Art Association and Museum. Before moving to Brooklyn in 1996, he lived year-round in Provincetown, MA, and spent his childhood traveling around the world with his Mennonite missionary parents. Born in San Francisco, Modern Expressionist Rachel Baird began her art career at age seven when a self-portrait was exhibited at the De Young Museum. Her first solo exhibition took place at age fifteen. She has been exhibiting ever since. Rachel attended the S. F. Art Institute and the Academy of Art University – San Francisco as well as studying with George Longfish, tenured art professor at U.C. Davis, California. She holds a degree in Fine Arts. Her search for elemental wildness sent her traveling, eventually spending several years in Colorado before moving to Vermont in 2003. Rachel says her main focus when painting with oils is capturing the movement behind what the eye can see: The force of nature in all things. She is currently exploring Kinetic Visual Art through use of a wide variety of media and conceptual installations. Visit Rachel’s website. I grew up, as many in New England did, learning how to knit and sew and stitch, more for the benefits of self-sufficiency than as art. 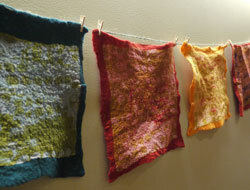 My love of creating with fiber was seated and has gained traction as I have explored felting. My early work reflected my gardens—flowers and pods and leaves adorning felt purses and pillows. My current work with felt feels less functional and more imaginary. Whenever I am outside, I find another interesting rock or shell or tree that I want to mimic in wool; or that provides a spark for my imagination. I try to capture some of that sense of awe and magic and surprise that nature provides. I am not trained as an artist, and have therefore found most of my successes born of mistakes and errors along the way, which has been some of the fun. I have been featured in Belle Armoire and Haute Handbags. I have long wanted to felt some prayer flags, never dreaming that a local visit by the Dalia Lama would be the final impetus to get such a project underway. Friends of friends collected prayers for me, and by the time the prayer-inscribed silk hankies got back to me, I found myself humbled by the trust that complete strangers placed in me, to handle their prayers with respect and dignity. I chose the colors of autumn—reds and oranges and rusts, and the deep blue of late-summer Lake Champlain—to distinguish the Vermont prayers; and fastened them to twine with little clothes pins, to capture that special sense of simple practicality that Vermont represents in an increasingly complicated world. I have had lifelong connection to sheep and wool. My mother knitted constantly, I married a sheep farmer and I just recently discovered that my early ancestors lived in the mountains ofNorthwestern Greecewhere shepherding is a way of life. The acorn has indeed not fallen far from the tree in my case. I became interested in needle felting at the Rhinebeck Sheep and Wool Festival and fell headlong into the fabulous world of felt from that point on, taking workshops, studying, experimenting and searching out felt exhibits at home and abroad. Among the teachers I have studied with are Brigitte Krag Hansen. Beth Beede, Jorie Johnson, Inge Bauer and Polly Stirling. A highlight for me was a trip to the Festival of Folk Arts inBudapest,Hungaryin 2004 where felt was featured and also shown in several museums in the surrounding area. I am currently a member of the International Felt makers Association and a felting instructor atFeatherstoneCenterfor the Arts on Martha’s Vineyard. For quite some time now I’ve reached that point in my artistic evolution where I create out of necessity: the necessity of feeling alive, the necessity of feeding my soul, the necessity of addressing the boredom that otherwise weighs my spirit down. These cardboard pieces started with an alteration to the basic unfolded cardboard box shape. I simply sliced them up with a mat knife until I found something that pleased me. Then I applied the paint out of the tube smearing colors together with paper towels. I sometimes think I paint like dogs eat: hardly stopping to savor the flavor. Feeling an urge to get shapes and colors down, I swallow quickly without chewing over my food. Decisions are made along the way but I like to make them before I have a chance to think about them too much. My process for creating ten minute plays is, I believe, a similar approach. I start with a premise, a situation, a setting, or some random characters. Then I let the characters start talking and see if it goes anywhere. I kind of feel like a kid pouring water onto the beach and running ahead of the stream with my plastic shovel to direct it’s flow, turning it, pooling it, stopping it now and then as it makes it way to the ocean. and make a bow of the affair. wondering why I ever thought swimming was fun. and did not wander away when the tides crept in. ruined, of course, with a terrible wheeze. It felt strange to leave it. but at sunrise it was gone, a memento on the horizon. I wished I wasn’t alone. of my future, because I am human. and the fog that eludes my fingertips. to the cave that does not shelter from the rain. Water has slithered into my eardrums. and eroded the tally marks on the west cliff face. down to the seashells on the seashore. afloat in only the shallowest pools . leave it in a similar fashion. pieces have fallen out of my field of vision. The earth echoes my own voice. I now count down to my own sunset. to fill my emptying stomach. between, for lack of a willing grip upon the sand. to tell—who, then, shall piece together the piano? a howling scream, worming through the mists. I fear I will be next, when the atmosphere readies once more. I have ceased to speak, even to myself. I was never once upon this island.